NEW from the innovative minds of EuroCave comes this combination Professional/Pure Line of Wine Cellars. EuroCave Pure re-creates the natural deep French wine cellar climate ensuring consistent optimum storage temperature and relative humidity levels while also allowing for accurate service temperature as well. It boasts up to an energy efficiency rating of A+ (A for Glass Door) making it a very "green" way to store and serve your finest wines. 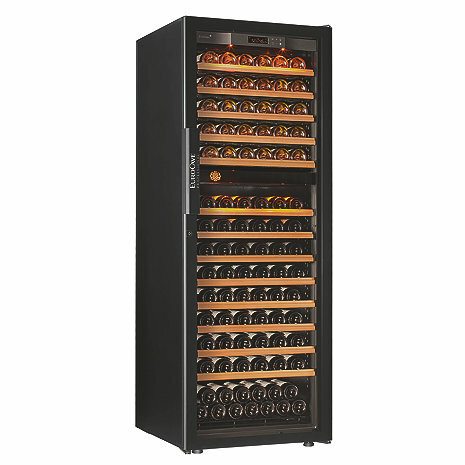 With its soft LED display lighting and full glass door features, the Professional/Pure Cellars offers beauty and elegance while keeping your most prized wines safe and ready to serve. With Dual Zone functionality both the top zone (whites) and the bottom zone (reds) are accurately controlled using the sophisticated and sensitive controls to maintain ideal serving temperatures. The temperature of the red wine service zone is adjustable from 59-68 F and the temperature of the white wine service zone is adjustable from 41-52 F.
Main du Sommelier ("Hand of the Sommelier") shelving features 12 adjustable "hands" that cradle your bottles individually and securely, just as a restaurant sommelier would. Each individual hand is a slightly concave bottle-holder lined with rubber insets to prevent bottles from rolling, rattling, or clinking together when sliding the shelf (in or out). Net Weight (Empty) 216 LBS. Can the Pure L Professional be built in? If so, what are the required clearances? While this is not a front venting cellar it is possible to do. You would need to have it on a 3"High platform that would allow for air flow. You would also need 3-4" of air clearance on top. We have not completed our installation yet, due to construction scheduling, however, Wine Enthusiast provided a document to us showing the built-in specs for the Revelation L/Pure L.
Do Champagne bottles fit in the shelves without the label rubbing? BEST ANSWER: Not with all the shelves installed. You can remove shelves to provide extra clearance, at the cost of the number of bottles you can store. There is storage at the bottom which would allow some champagne storage, but if you want to fill the EuroCave with champagne, you'll have to sacrifice some storage space. One shelf in the white area (bottom self) can accommodate sparkling bottles. The rest would require shelves to be removed. Yes, you will find a place to store it in a Eurocave, depending on the size of the champagne bottle too. There is also a larger area at the bottom of the cooler to store larger bottles . If the Pure-Professional L is installed against a right side wall with a right hinged door, can the shelves be pulled out? Or do you need to open the door past the point of being perpendicular to be able to pull shelves out? Asked another way, what width is required to open the door? BEST ANSWER: If you have leave a 1/4 inch on the hinge side of clearance than you will be fine to get the shelves out. This is a great wine storage unit. I chose the two temp model instead of the 55 degree fixed model. I have aged wines for 30 plus years but I have gotten too old to cellar wine for 15-20 years. Therefore I drink my wine shortly after I buy it but like to store enough wine to have a choice when I'd like to drink a bottle of wine. The only thing you should know is that it doesn't hold the capacity stated unless you are storing only Bordeaux size bottles. When you have bottles from Rudd and Andersons Conn Valley which are bigger than Bordeaux size you may get 9 -10 bottles per shelf. I had 144 bottles to store and I was able to store all but 3. The unit is super quiet and the temps have been stable in the basement/garage with the fluctuations of temp you may expect in a basement/garage. It sets up easily and the drawers are very nice and move easily. I am pleased with the unit but I've only had it for 2 weeks. This is my first wine cooler/storage unit. I spent months researching various brands. The one thing all the people I spoke to said the same thing. Eurocave is the best. You might not need the best, but it is what everyone else tries to be. I got mine, waited two days, filled it up, and couldn't be happier. My storage wines are in a perfect place and my daily drinkables are in a perfect place. Worth every penny, so far. This is the fourth wine cabinet I have owned, and I can honestly say it is absolutely the top of the pyramid in terms of performance, appearance and quietness. The drawers and bottle holding couches are really smooth and a pleasure to use. My cabinet is full, but the collection is easily visible. The temperature controls are easy and very precise, and the air flow around the cabinet gives one confidence that the bottles are being well cared for. The automatic lighting and the shelf labeling is are great, and the labels are very easy to move or change as you consume some and buy other bottles. Expensive, but lives up to expectations. Overall, I am very impressed with the wine unit. It is very quiet and is quite easy to open drawers to retrieve a bottle of wine. The setup was quite easy and the delivery was on the day I needed it delivered. The one drawback to the unit is the temperature selection is limited to the few preset temperature levels. The bottom zone will not go below 59 degrees even though a temperature in the range of 54 to 56 is recommended for storing red wines. I would definitely recommend EuroCave. We downsized from a home that had a large wine cellar room and spent some time researching stand alone units. We love the features and the look of the EuroCave. Enjoying mostly reds and occasionally Champaign this unit is absolutely perfect for us. We always have our favorite selection ready to go at drinking temperature. My wife and I have had a very fine under the counter wine chiller for 10 years. We decided it was time to upgrade to a large free standing unit to accommodate our growing wine collection. We did a lot of research before we settled on the Euro Cave Pure Professional L. We are very pleased with our decision! The old adage, when it comes to unquestionable quality “you get what you pay for”, certainly applies here. The unit is soo quiet and the temperatures/humidity are perfect throughout the unit. If you love whites and reds and only have room for one cellar, I would recommend this one. Dino at Wine Enthusiast answered all my questions about the various cellars available. After a week I ordered the EuroCave Pure-Professional L Dual Zone Wine Cellar and it is perfect for our needs. This wine cellar is very expensive when you consider the price of a full size normal refrigerator. Because of that I avoided it when first purchasing. We finally got sick of the crappy Summit we had, the terrible service, etc. And just decided to pull the trigger on the best. Long story short, this thing does exactly what it is supposed to do. It looks great, holds consistent temps throughout, and has amazing shelves. Honestly...the shelves are killer. Only possible improvement I can think of: Allow the user to adjust the height of shelves more easily. Most of them can hold a standard pinot bottle without issue. Any bottle larger than that (sparkling or Papillon) won't really fit on most shelves. I'm not sure it truly justifies the cost but this is a niche market and the other options are abysmal. That may be a strange review but we do love this thing!